I was out checking out the Charleston Maritime Center for Charleston Watersports Week. I'm there working Time Out Sports representing Jackson Kayaks. While there today Marian pointed out a new concept for kayak fishing or just kayaking in general. This concept is a kayak pod that is towed behind your SUP or Kayak. 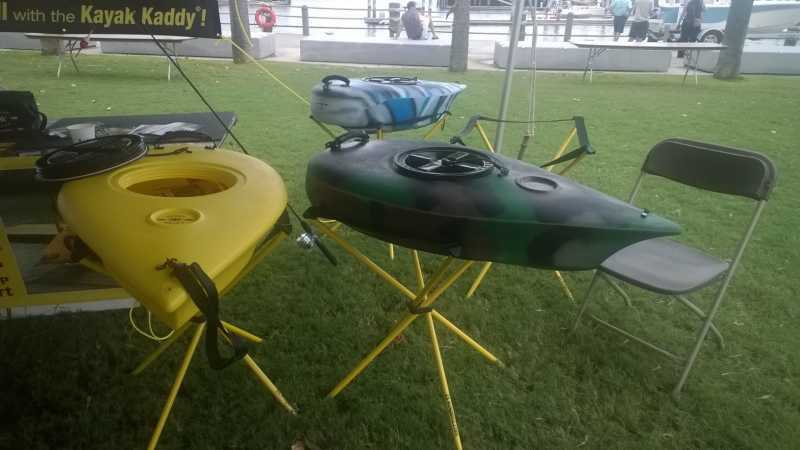 This pod is called a Kayak Kaddy. 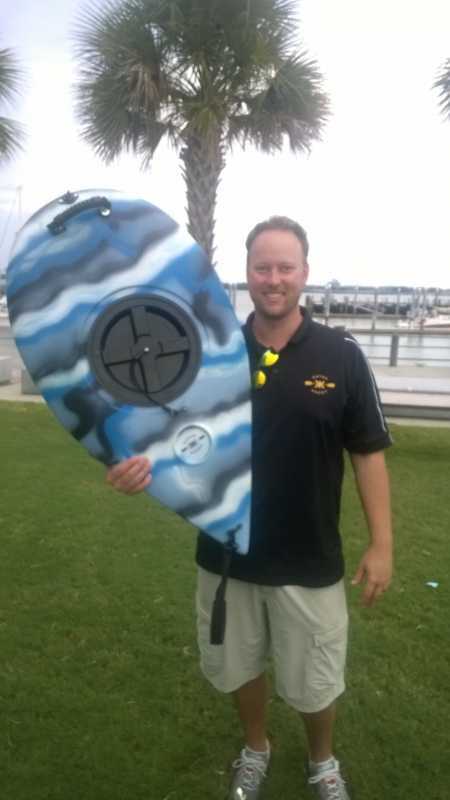 Here is a photo of Nick Biron - VP of Marketing displaying the Kayak Kaddy. Here is a video of the Kayak Paddy in action bass fishing. I'm trying to convince them to participate in the Boondoggle for the vendor's village. They are making every effort to keep this an American made product down to the accessories. Cool I could also see myself using this as a floatable cooler. Wonder what it's like towing that, do you feel drag while towing? Cool concept would like to get our hands on one for a test! Those are interesting, but I bring too much crap as it is. I'm trying really hard to bring less so I won't need a trailer. Would those be called a 5th Paddle? (as opposed to 5th wheel) or Bow-neck Trailer maybe? Please send rain to the following address...Texas. Last Edit: 4 years 7 months ago by Aggroman. Good idea if you need additional room on the water but I would rather not add any drag behind me. Save the earth. It's the only planet with kayaks, fish & chocolate!!! Nick from Kayak Kaddy will be building me a fishing version of the Kayak Kaddy for me to demo down at the Boondoggle. I will be doing a report/review for YakAngler on this new product. If any Boondoggler would like to try it contact me at the Boondoggle and I will lend it out. Also if you see me towing the kaddy stop by and see if the beer is still cold.